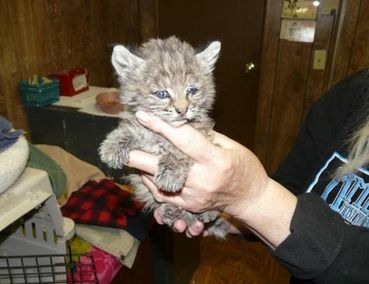 "A baby bobcat, found burned and dazed during the tail end of a Northern California wildfire, has been rescued and treated at a local wildlife rehabilitation center, reported the San Francisco Chronicle. The Chips Fire, north of Lake Tahoe, has burned through more than 75,000 acres in the Plumas and Lassen national forests since the end of July. While patrolling and cleaning up the north end of the wildfire on Aug. 25, crews found a baby female bobcat covered in soot, wandering alone along the side of the road. �It seemed to be confused,� said Tad Hair, the Mad River Hand Crew superintendent who saw the kit, on a U.S. Forest Service blog post." Thanks Simone D, for highlighting this story. Thanks Simone,for bringing this to our attention.I hope Chips fully heals,so glad the wildlife rehab can help this precious baby. Presladak je,nadam se da će biti dobro. AM so glad the kitten was found and cared for, bless her, i just hope the mother and its siblings got away from it! what beautiful blue eyes! Thanks to all who helped. So adorable and so sad! I hope Chips is able to be reintroduced back into the wild. Poor mama bobcat, though.